Peer review – In the UK, doctoral theses are examined by a panel of two people: your internal examiner who is appointed from within your department, and the external examiner who is brought in from outside. The external in particular should be a senior academic who is an expert in your field. They will be looking to critique your work and probe your understanding to ensure that you know what you are talking about. By passing the thesis itself through academic peer review at a journal, you can iron all of the little kinks out of the work and benefit from the insights of your reviewers (assuming that they are helpful). It is quite likely that the reviewers of your manuscript will know the particular chapter better than your external examiner, making their critique more detailed and informative. Having a partially (or fully) peer-reviewed thesis under your arm when you walk into your viva/defence won’t guarantee you a pass (you still need to demonstrate an ability to defend your work), but it is certainly reassuring! CV enhancement – The number of PhD graduates going into tenure track positions in my field was over 50% in the 1970s, but that number is now closer to 10-15%. The huge pool of doctoral graduates means that competition is fierce and we really are in a “publish-or-perish” environment. Get those papers out and you will look much more attractive to hiring committees. Experience – Publishing in journals is a complex and arcane process. Your first couple of efforts might end up in poorer journals than they deserve just because you haven’t quite managed to pick the right angle for a top journal or because your writing isn’t clear enough. Get that out of your system early on and you will benefit later. Personal satisfaction – There is nothing better than getting that first publication under your belt. It is like graduating all over again, receiving the proofs from the publisher with your name in the author line. Be patient – Sometimes graduate students publish excellent papers during their MSc or PhD, but this is relatively rare. Don’t go expecting that Nature or Science paper to come out immediately. You need to be submitting to realistic journals so that (i) you don’t spend too much time reformatting for resubmissions after rejections, and (ii) you actually get peer review comments rather than straight out rejections. Publish whenever you can – This ties into gaining experience and check marks on your CV. People often say that there are two strategies: you can publish many poor papers or a few good ones. However, this doesn’t seem to be the case. In fact, in the sciences there is a positive correlation between quantity and quality (you can read some of the possible reasons for this here). Don’t worry about impact factor – Finally, you should publish in the most appropriate journal and not waste time during your PhD chasing the top journals. Your PhD is one of the few times when you will be able to focus purely on research, so make sure you leave yourself plenty of time for work. There will be cases where big papers are needed, but the impact factor of the journal doesn’t necessarily correlate with the impact of the work itself. Note that I published a few papers during my PhD but they were mostly in low-impact journals. Despite this, one of those (a review article in a journal that didn’t even have an impact factor) has been cited 25 times. Getting those papers on the board really helped me during my PhD for the reasons stated above, and I think I benefited a great deal from having taken the time to get those early articles out. So what do you think about publishing during PhDs? What have your experiences been? Feel free to discuss in the comments. Very good advice! 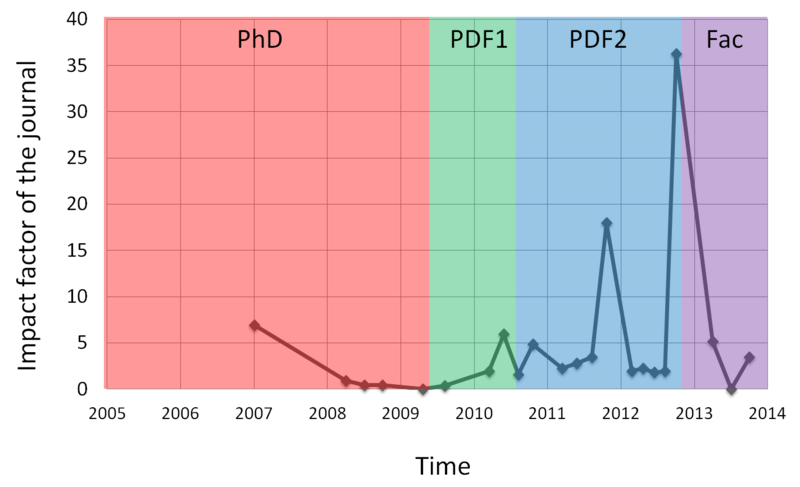 Some of the data of my PhD Thesis ended up in multiple publications, but only after I finished writing my PhD thesis. The reviewers of the papers gave some really helpful comments, that I unfortunately could not implement in my thesis anymore.. Would’ve been better to aim for publishing earlier!